​Visible house numbers that are easy to find and easy to read are one of the best safety features that your home or business can have. Valuable property and lives can be saved simply by posting adequate house numbers where emergency personnel can find them without wasting time. Numbers must be visible from the street, 3 inches high and contrasting in color from the house. 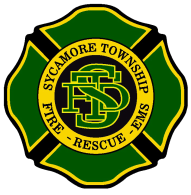 The Sycamore Township Fire Department sells these green reflective signs for $9.00 (sign only) and $14.00 (sign & post) each. The numbers on the signs can be placed horizontally or vertically. 1. The address sign will be placed in your yard in a location determined by the fire department. This location will be the most visible in order to identify your individual house or driveway. 2. If the address sign customer does not want the sign in the location determined by the fire department, he/she reserves the right to have the address sign delivered only, and not installed. 3. For address signs with posts, the utility companies will be notified in order to have the underground utilities marked. This will also determine where the address sign post can be safely installed. The fire department will notify the utility companies. 4. The fire department WILL NOT provide services for the maintenance and upkeep of the signs once they are installed or delivered. 5. Sycamore Township assumes NO liability for the address sign once it is delivered or installed. 6. Please allow 4 - 6 weeks for the installation of signs and/or posts.